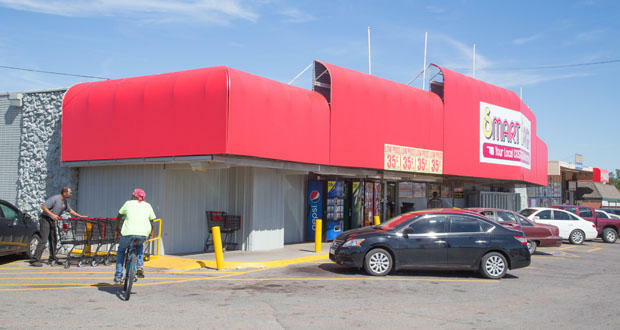 The Smart Saver grocery store at NE 23rd Street and Martin Luther King Jr. Avenue in Oklahoma City. A bill that passed the Oklahoma Senate would establish a fund to get more fresh, healthy food into underserved areas. Senate Bill 507, by Stephanie Bice, R-Oklahoma City, would create a mechanism to help small retails like convenience stores and grocers to stock fresh, perishable items. Catherine Sweeney writes in the Journal Record that the Healthy Found Financing Act establishes a revolving fund for the Oklahoma Department of Agriculture, Food and Forestry. More than half of the state’s counties are considered to have low food access, said Betty Thompson, deputy commissioner of the Oklahoma Department of Agriculture, Food and Forestry. More than 50 counties contain a food desert. The problem plagues rural areas, where residents can live more than 10 miles away from the nearest grocery store or other healthy food vendor. It’s also present in urban areas, where residents live more than a mile from access to fresh produce. “Low-access food areas tend to have higher health issues, so higher costs for health care,” she said. Some of Oklahoma’s most expensive health care issues stem from chronic diseases such as diabetes and heart disease, said Candace Macedo, obesity prevention coordinator for the Oklahoma State Department of Health. “All of those have a nutrition component,” she said. The bill’s supporters argue poor food access is a major contributing factor to Oklahoma’s high rates of obesity and chronic disease, and that low-access areas tend to have higher health costs. Journal Record editor Ted Streuli told KGOU the initiative would receive no state appropriations. In addition to construction or equipment costs, the funds could cover market research, property acquisition or energy efficiency upgrades, according to the bill. To qualify, applicants would need to prove their projects are economically sustainable. They would have to guarantee they could follow the program’s conditions for five years. The businesses would have to accept money from the Supplemental Nutrition Assistance Program, also known as food stamps, and the Women, Infants and Children program. At least 30 percent of the merchandise would have to be fresh produce. A similar bill was introduced last session by State Rep. Seneca Scott, R-Tulsa, but it did not pass. Gov. Mary Fallin then requested a special task force to look into the issue. Sen. Bice’s passed the Senate on March 22, 2017 on 31 to 11 vote. Streuli says opponents argued the bill picks winner and losers among the state’s food retailers. “They think public funds shouldn’t support a faltering businesses at the expense of successful businesses in more populated areas,” Streuli said. Senate Bill 507 now heads to the House Agriculture and Rural Development committee. Jacob McCleland: Ted Streuli, thank you for taking the time to talk with us. Ted Streuli: Glad to be here. McCleland: So the Healthy Food Financing Act would try to help bring more healthy food into areas that don’t have a lot of access to it. How would this work? Streuli: It would create a mechanism to help grocers and small retailers like convenience stores stock more nutritious, perishable items, non-processed foods. It’s Senate Bill 506 and it would establish a revolving fund that the Oklahoma Department of Agriculture, Food and Forestry would oversee. So the money would have a lengthy list of possible projects it could fund, but it would include things like helping business owners build new locations, or expand existing stores or buy new equipment. And it could also pay for communities to bring in mobile farmers markets or establish community gardens, things like that. McCleland: How much of the state has low access to food? Streuli: Well, the State Dept of Agriculture estimates more than half of the state’s counties are considered to have low food access. McCleland: How much would this program cost the state? Streuli: The initiative would get no state appropriations. The Department of Agriculture’s existing grant coordinator would handle the caseload, so they wouldn’t hire anybody. And the program would take donations and federal funds, place those into a state revolving fund, and then operate through grants. McCleland: The bill has its share of opponents. What were their arguments against the measure? Streuli: Well, the main argument is they say the bill picks winners and losers among the state’s food retailers. So they think public funds shouldn’t support a faltering businesses at the expense of successful businesses in more populated areas. McCleland: Let’s change topics now to talk about one of the MAPS 3 projects. Journal Record reporter Brian Brus writes the bidding process will begin on the north part of a 70-acre MAPS 3 downtown park. Where will this park be located? Streuli: Well Jacob, the park will be generally bounded by the new Oklahoma City Boulevard, S. Hudson Avenue, Interstate 40 and S. Robinson Avenue, but it is split into an upper and lower section by I-40, and the Skydance Bridge will be what connects the upper and lower parts of the park. McCleland: What’s the design of the park look like? Streuli: Well, the first 36 acres that will be developed are going to be subdivided into 15 attraction areas. That’s going to include things like the great lawn, a cafe, a renovated Union Station, some water features, playgrounds, botanical gardens. And then eventually as the whole park is developed, there will be a large pond with a boathouse and a very large performance stage and some other amenities. McCleland: What is it going to named? Streuli: Well we don’t know yet. Mayor Mick Cornett has opened up a website. It’s okc.gov/NameYourPark. And the city is taking ideas through April 7. And then a selection committee will choose a name from among the most popular that were suggested and they’ll announce it at the park’s official groundbreaking. Corporate naming rights are going to be available for the individual park attractions, but not for the park itself. They want a name that won’t ever change, and sponsors tend to come and go.